Escape to two of South America’s iconic cities with a guided tour of Rio de Janeiro and Buenos Aires. Your escorted vacation in Brazil and Argentina is full of a variety of inclusions as well as unhurried time to explore and experience the colorful culture of each destination. First, you’ll visit the exciting city of Rio de Janeiro-known for its beaches, vibrant atmosphere, welcoming people, and, of course, Samba music and dance! On your guided sightseeing tour of Rio, you’ll take the cog railway 2,300 feet up to the summit of Corcovado Mountain to view the famous Christ the Redeemer statue. Take in the 360-degree view of Rio from above. Later, dine at a traditional Brazilian barbeque steakhouse or a churrascaria as it’s called in Rio! You will also have a free day to explore on your own. Next stop, Argentina and a crowning highlight of your Brazil and Argentina Escape – a trip to magnificent Iguassu Falls. You’ll see one of the world’s most spectacular natural sights, with the thundering falls cascading over a 2-mile-wide, 250-foot-high cataract. Witness the falls’ brilliant rainbow effect on both the Brazilian and Argentine sides of the falls and take the ecological jungle train through the rainforest on the Argentine side to fully experience this natural wonder. Continue to Buenos Aires-known as the “Paris of South America” for its wide boulevards, outdoor cafés, and inviting shops. Go sightseeing with an expert Local Guide to see the city’s historic landmarks, including Eva Peron’s resting place at Recoleta Cemetery. And, no trip to Buenos Aires would be complete without a Tango show, which is included along with an Argentinean meal. 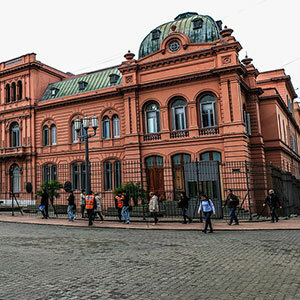 You’ll also enjoy a free day to explore the rich atmosphere of Buenos Aires on your own.